I have recently been scanning some of my old negatives from the early 1980s. The Lord Mayor’s Show post from a couple of weeks ago included some of these photos, and this week’s post covers a rather more unusual event when in 1983 the Space Shuttle Enterprise landed at Stansted Airport – or London Stansted Airport to use the current full name and provide the hopefully not too tenuous link to the theme of the blog. 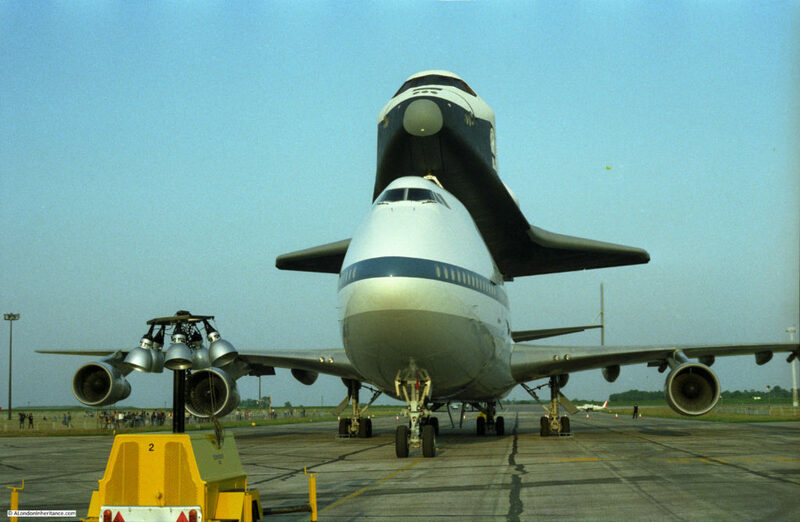 The first orbital flight of the Space Shuttle took place in April 1981 and in 1983 the Space Shuttle fleet was increasing the number of flights with four taking place that year. 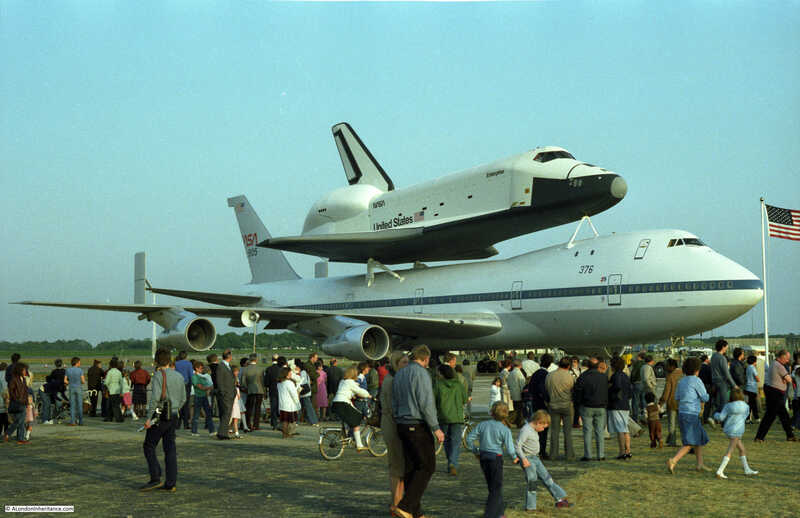 There was considerable interest in this new method of reaching space and in 1983 the Space Shuttle Enterprise made a visit to the Paris Airshow, also landing in the UK and Germany. The Enterprise did not launch to space. 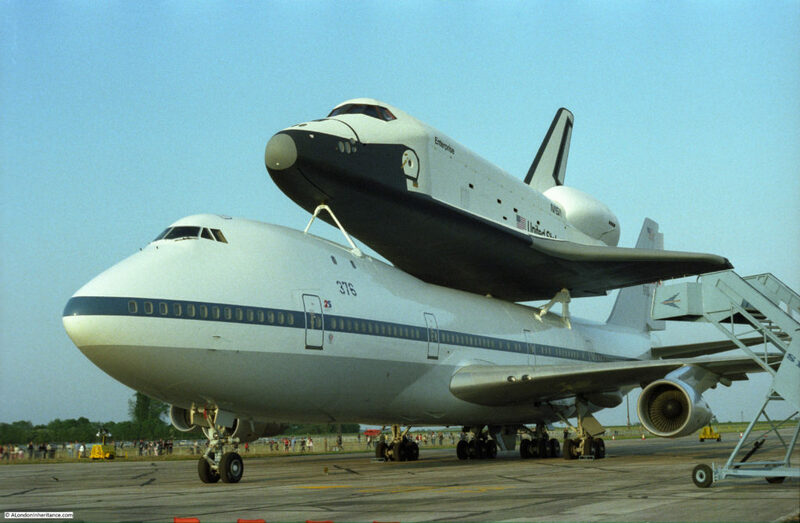 It was the first of the Space Shuttles (named after the space ship from the Star Trek TV series), completed in 1977 and used to test the piggy back method of transport on a Boeing 747 and also for drop tests to evaluate how the design would fly and land. 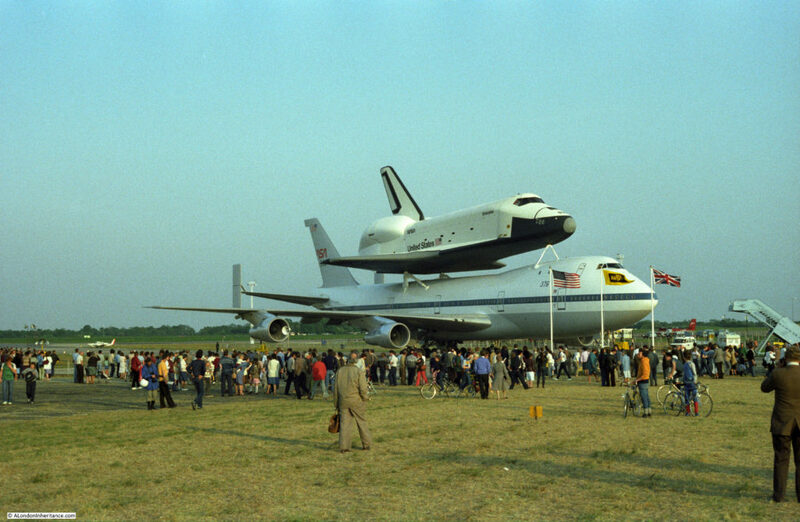 The Enterprise arrived at Stansted Airport on Sunday 5th June 1983. Stansted was then a small airport with relatively few flights. Approval was granted the following year for the first phase of the significant developments that have seen the airport reach the capacity it has today, so back in 1983 it was still quiet and an ideal location to host the Space Shuttle’s visit. The arrival was a major event with significant numbers of people turning up to try and see this unusual combination of aircraft land. There was major congestion on the majority of roads in the Stansted area. For some reason I cannot remember now, I could not get to Stansted for the Sunday, but did manage to visit on one of the evenings the following week. I was working in Lambeth at the time so it was a dash up to Stansted after work on a lovely sunny evening which I do remember very well. It seemed a very casual event. Compared to today, hardly any security of any sort. Drive up to the airfield, park on the grass and take a walk around – I doubt this would happen today. I cannot remember which day it was, or the time but it must have been late evening judging by the length of the shadows (which is rather depressing to write on a dark December evening). 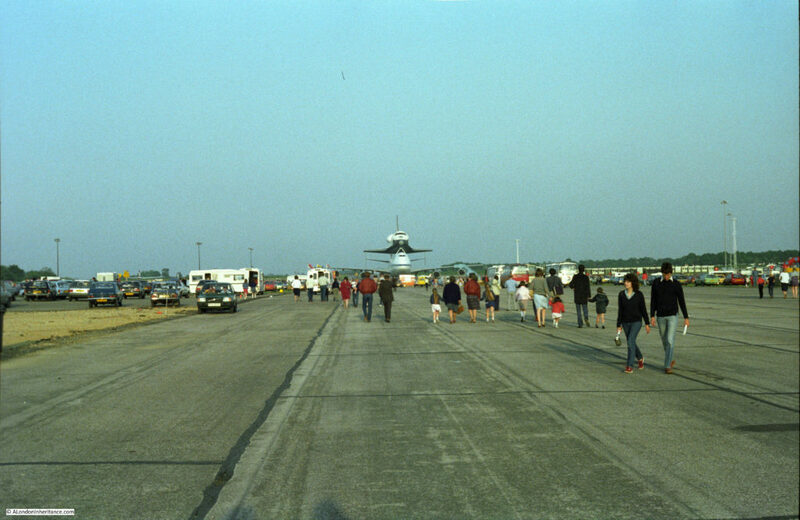 There is a BBC report on the Space Shuttle visit and the 25th anniversary which can be found here. 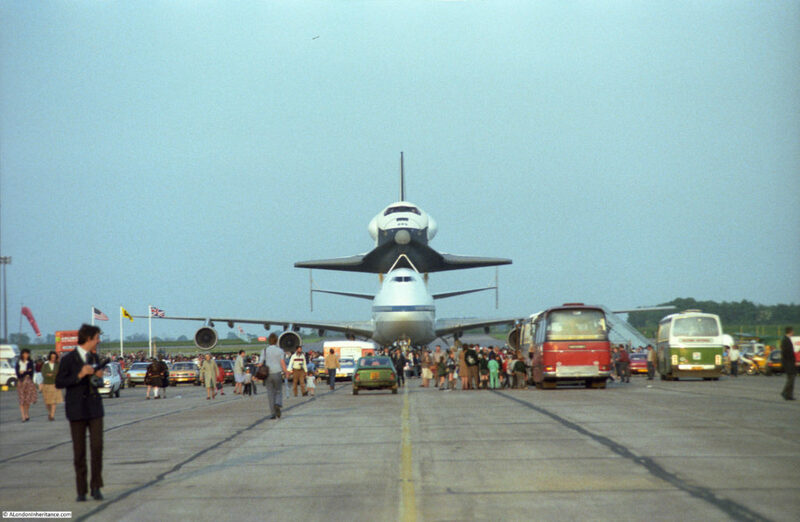 The report contains some excellent film of the landing of the Shuttle / 747 combination at Stansted. I did not get to see the Space Shuttle leave Stansted, but did catch a glimpse of the flight over London, although unfortunately I did not have my camera with me. 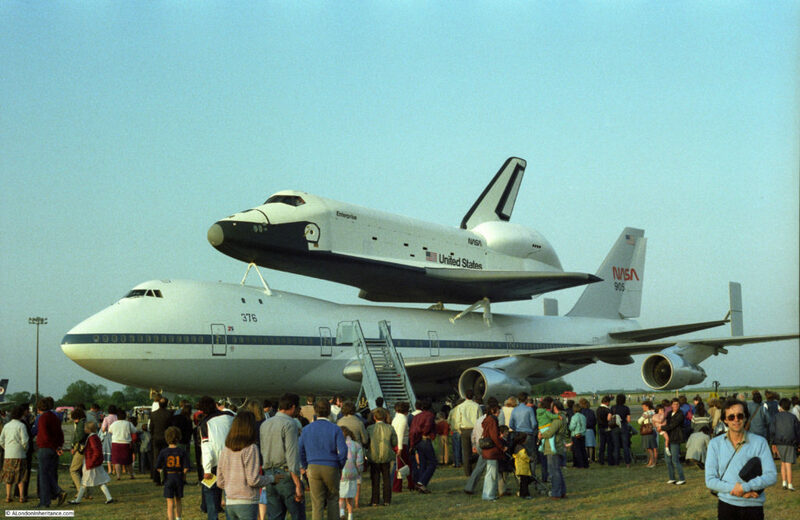 After the visit to the UK, France and Germany the Space Shuttle Enterprise returned to the US where it was used for test purposes, then a period in storage and then on display with the Smithsonian Institute. Space Shuttle Enterprise is now on display at the Intrepid Sea, Air and Space Museum in New York along with a British Airways Concorde – another form of flight which seemed technologically very advanced at the time, having started the first supersonic passenger flights just a few years earlier in 1976 and in some respects would go on to have a parallel history to the Space Shuttle. 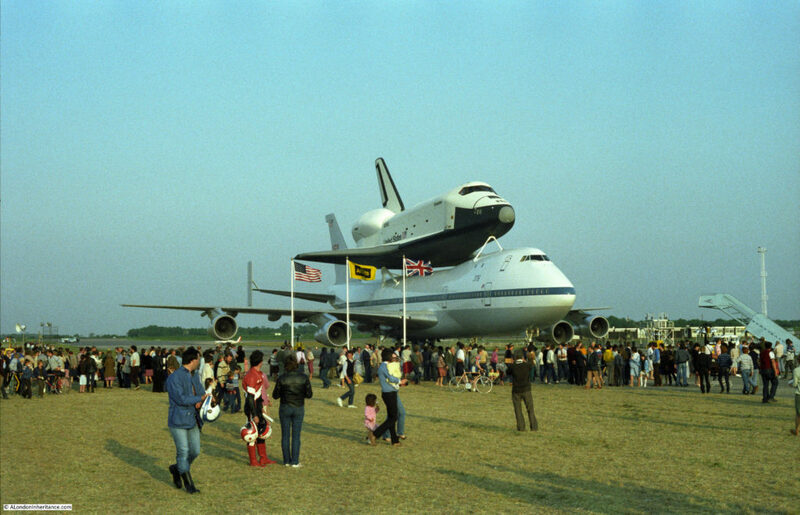 This entry was posted in Events and Ceremonies and tagged Enterprise, Space Shuttle, Stansted Airport on December 11, 2016 by admin. Impossible to imagine the public being allowed anywhere near these days. I rather like the ad hoc feeling of this – as if people have just pottered along to pass a lovely evening. Marvellous. I remember this well. It did a fly-past of LHR too. Air traffic control joined it to the flight path and it did a low pass near where I worked back then. I’m fairly sure it was on the weekend. I didn’t have my camera either. Some time later, in 1998, I took a trip to Florida to witness Discovery launch with John Glenn on board. An amazing experience: film doesn’t come close to capturing the awesome power and majesty of it all. Or speed, especially speed. Shocking to think that between this and Concorde, USA can no longer deliver her own astronauts to the space station and civilians can no longer travel supersonic. We’ll be living in yurts before long. I really enjoyed this post and the pictures of the shuttle piggybacking on the 747, even though I don’t remember its visit here at all.